Scratches or also grooves are light mechanical damages on the surface of the material. They can arise into the most different processing steps. In most cases the material is lead along at sharp edges which then leave a more or less strong deepening. Scratches at the ready material have to be avoided in every case. Scratches in a preliminary stage can be often still removed. 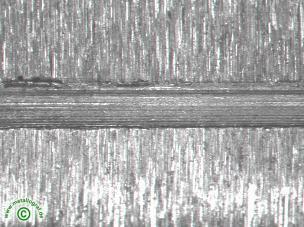 In this case the scratch, groove, has reached the ready steel bar after grinding.